An Cosantóir is Irish for “The Defender”, originally founded in December 1940. An Cosantóir is a 40-page full colour A4 size publication, issued 10 times per year. The journal carries information on all elements of the Irish Defence Forces. Topics cover all aspects of military life, including training, overseas operations, new equipment, personalities, events, international military affairs, humanitarian work, unit activities, and military history. 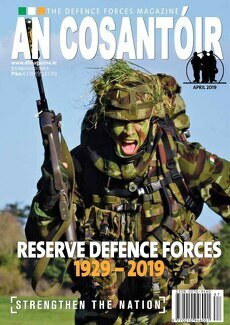 www.DFMagazine.ie is the enhanced web presence of An Cosantóir magazine and aims to offer readers of the magazine an added depth to their knowledge of the fast-changing Irish Defence Forces. Over the coming months, we will be incorporating a range of innovative developments on this site, so please bookmark us and check back regularly. We would also greatly appreciate it if you could take the time to send us some Feedback. Current monthly print run of the magazine stands at 5,000 with a readership of 25,000 (with up to 45,000 unique viewers with our On-Line version) and the magazine can be purchased from selected newsagents or can be received every month through the post by subscription. Go to the Subscribe page for more information. An Cosantóir is published by Public Relations Section, Defence Forces Headquarters, Ceannt Bks, Curragh Camp, Co. Kildare.